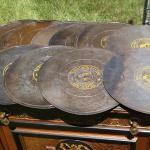 They worked off of a chain drive similar to a bicycle and a ceiling mounted motor. 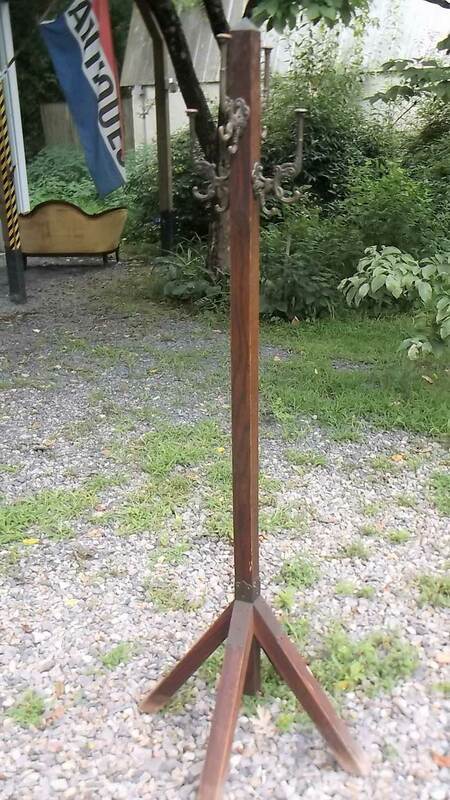 17” Wide x 36” Long each, Where you gonna find them again?? WAS $350.00 . . .
WAS $135.00 . . .
WAS $650.00 . . .
Would have been an item taken to showcase a particular shops typical work product. Solid Oak, very small scale, knobs replaced. Soda can for size perspective. 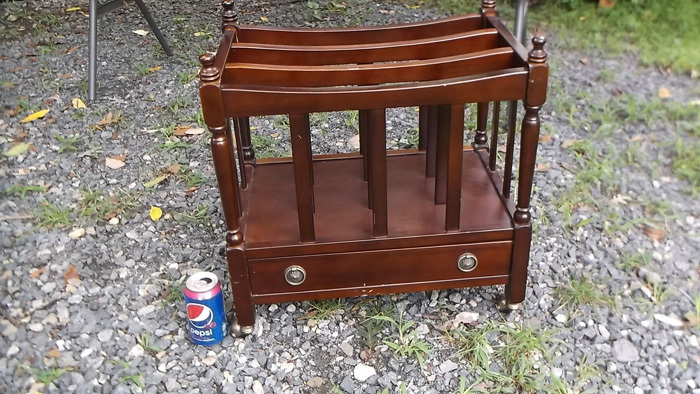 WAS $195.00 . 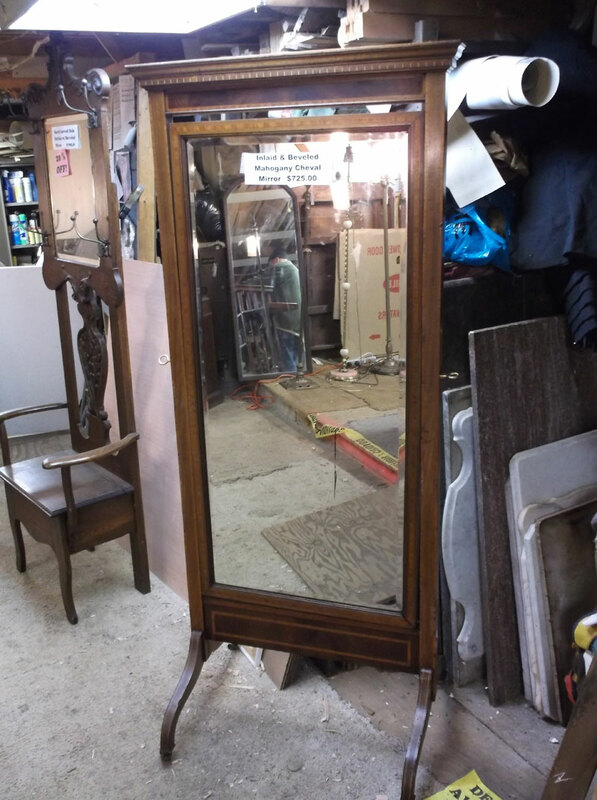 . .
Beautiful free standing Cheval Mirror, inlaid details, beveled glass with good reflection, Greek Keynotched detail on frame top. 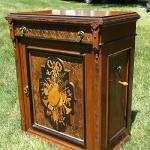 Beautifully carved, open leg, double door curio cabinet. 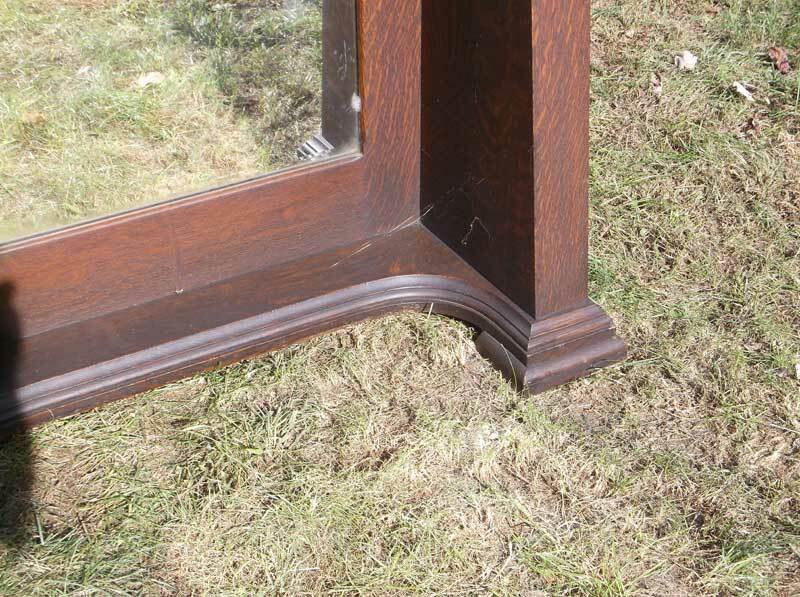 Solid walnut, gracefully curved legs with carved knees and feet, Heavily carved doors and crest above. Two interior shelves, a real stunner! 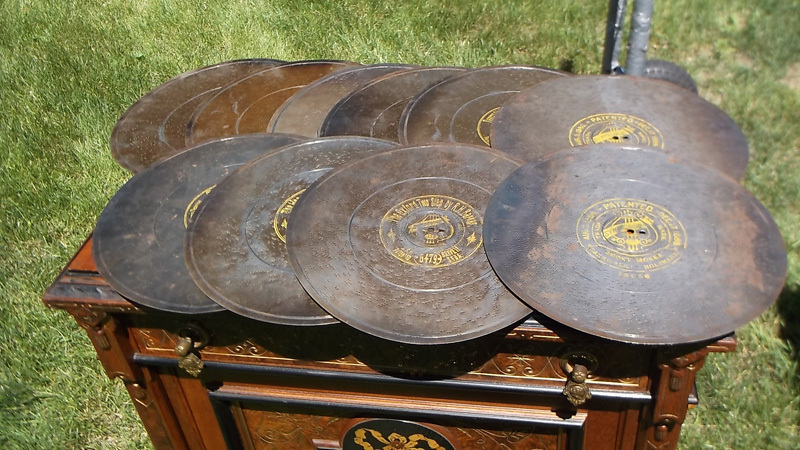 WAS $475.00 as shown . 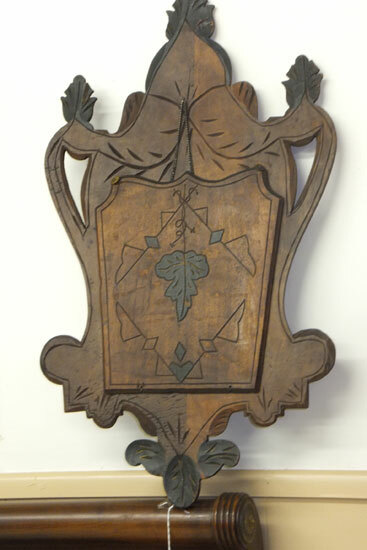 . .
THREE panel folding screen, solid oak frame, top panels contain copper backed open fretwork design, bottom of panel originally contained fabric. Will have your new supplied fabric installed included in purchase pricing. 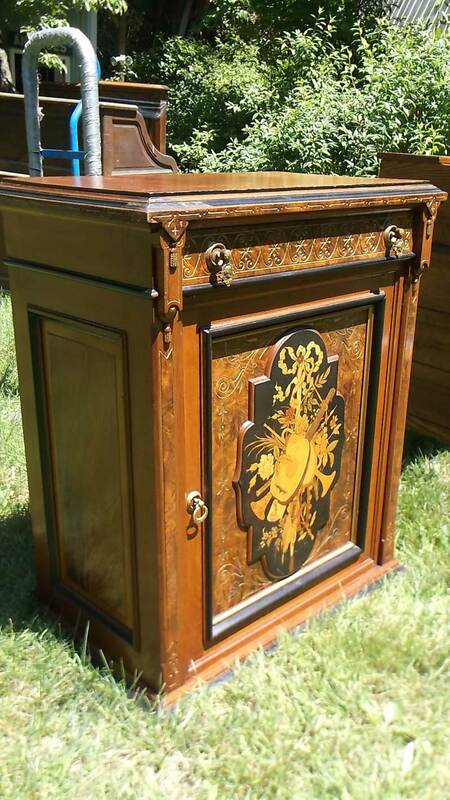 Very ornate and carved radio cabinet. Interior has been removed and center shelf added. 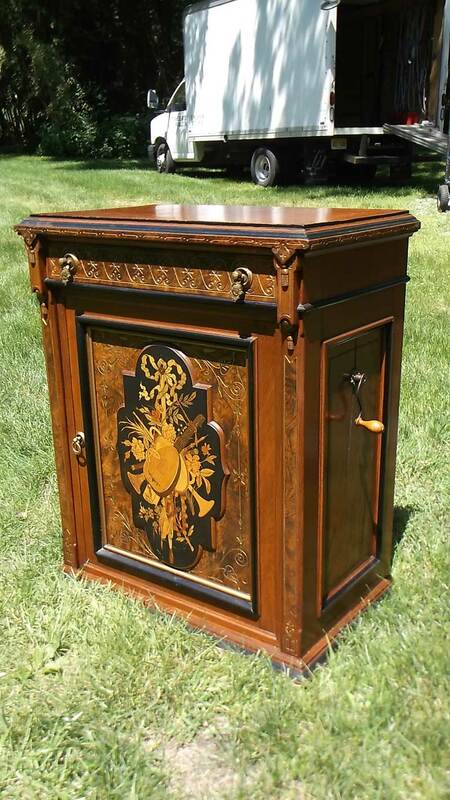 Can now function as a bar, free standing storage cabinet, whatever your particular need. WAS $240.00 . . . 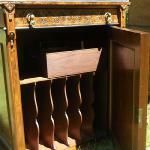 Absolutely stunning solid Rosewood double door cabinet, with lion’s head pull and silver handles on sides. 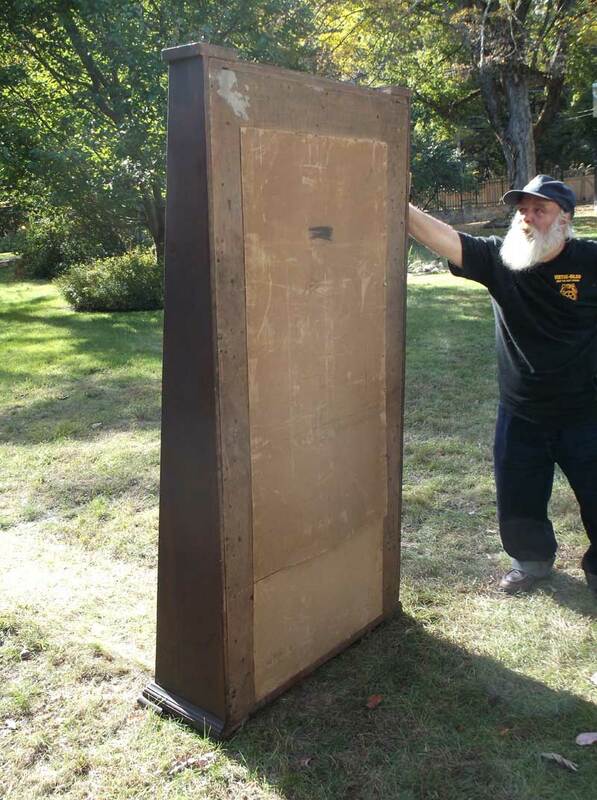 Raised panel construction all four sides, 2 shelves inside. 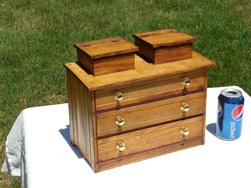 Would be a perfect piece for a small powder room, with or without a sink installed. 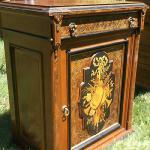 A really gorgeous cabinet, really must be seen to be appreciated! 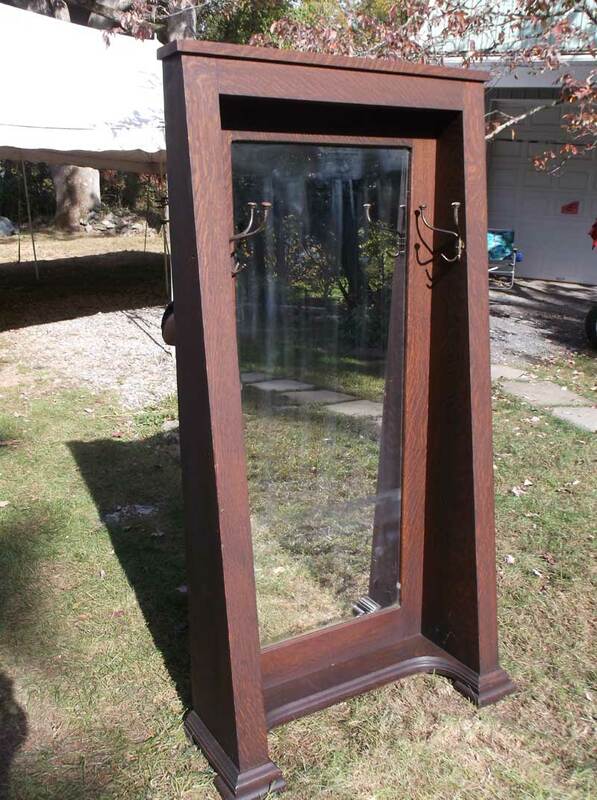 RARE Original free standing mission oak wardrobe mirror. 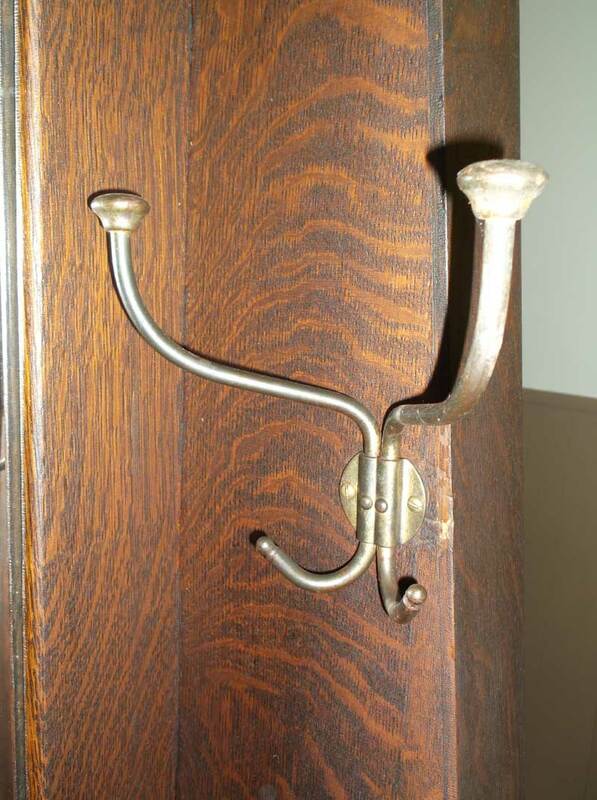 Original fumed finish, two 2 arm coat hooks inside with original beveled glass full length mirror. Some distressing in mirror only adds to its character! You will not see another one! 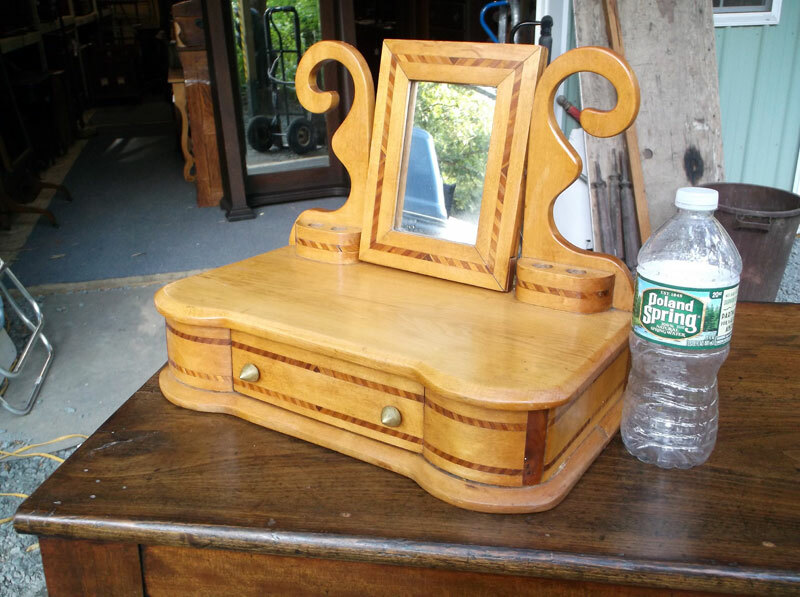 Lovely golden pine table top shave mirror, with inlaid mahogany accents. 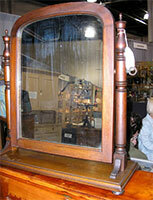 Mirror pivots with drawer underneath. Excellent condition with a very striking look! 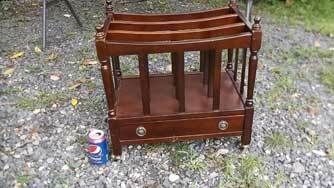 Good mahogany color and finish. 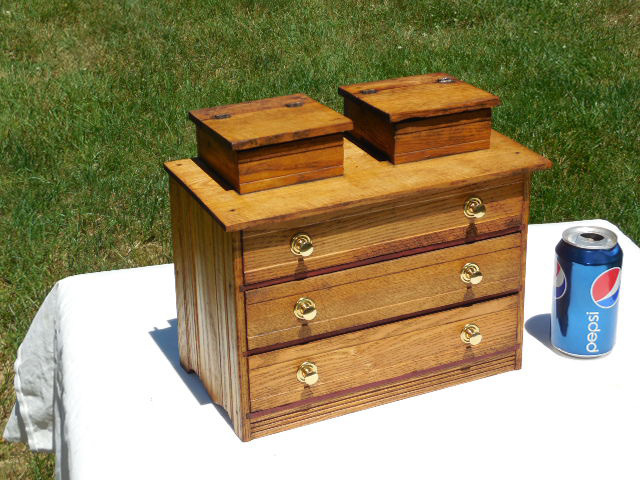 Mid 19th century, Southern Yellow pine with upper and lower arms and ball column. 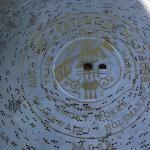 Good original finish, excellent condition given it’s age. $450.00 WILL NOT SHIP UPS! 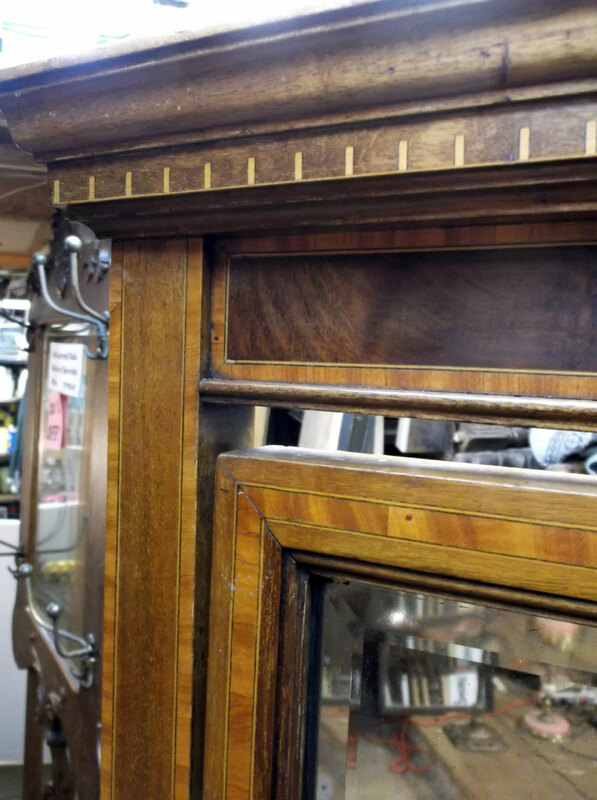 Beautiful formal mahogany cheval mirror with satinwood banded inlays, key notched detail at crown, pivoting mirror. Never mind that Keurig! This is how to grind those beans right!! 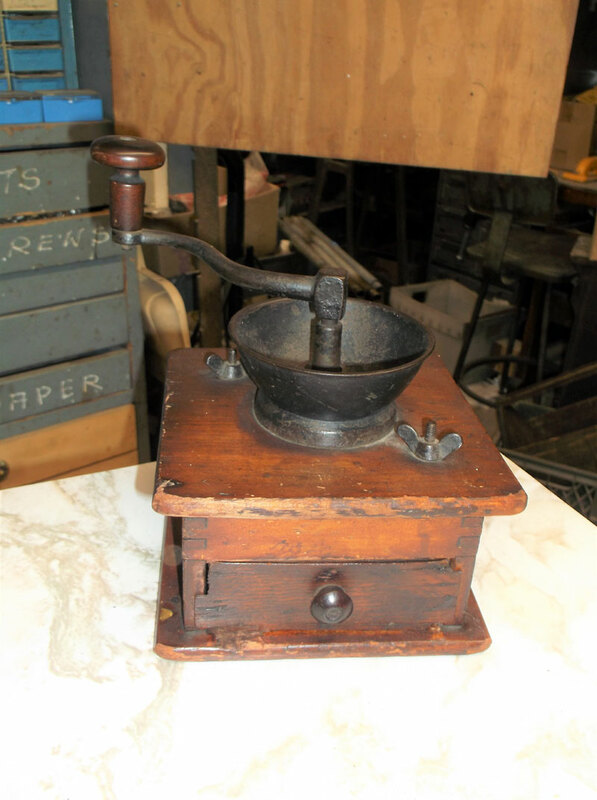 Circa late 1800’s table top Coffee Grinder, showing some wear and tear, but still a great look! 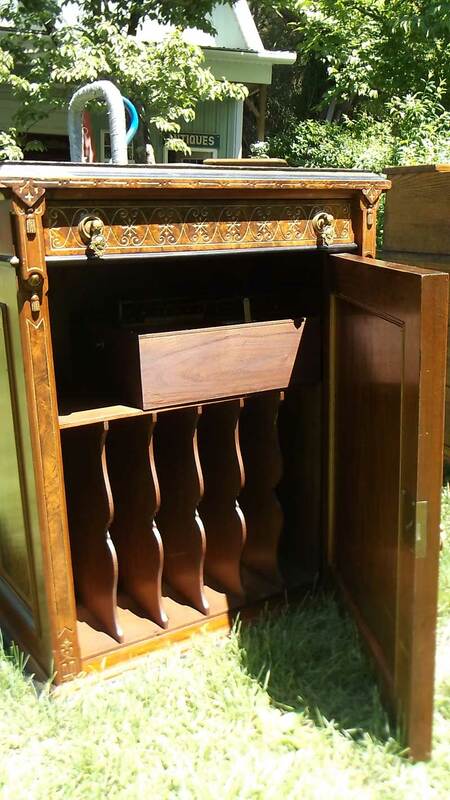 Teak Entertainment center with 2 drawers, Signed “Made in Denmark”, Right side rests atop the left, and can be collapsed or extended as needed. 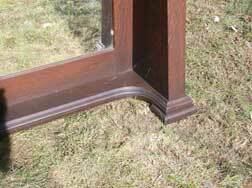 Good finish and color. I was told it came from a dentist's office. 3 sides glass, chrome latch missing catch. 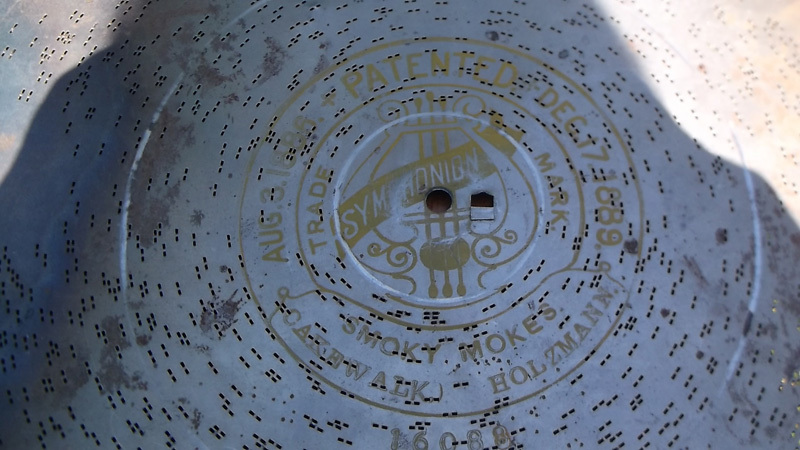 Inside cabinet is a German made disc player in good orking condition and 11 metal discs. . Music player SYMPHONIUM Number E-30, with 19 patents dated from 8-3-1886 to 3-28-1899. Has beautiful sound quality. 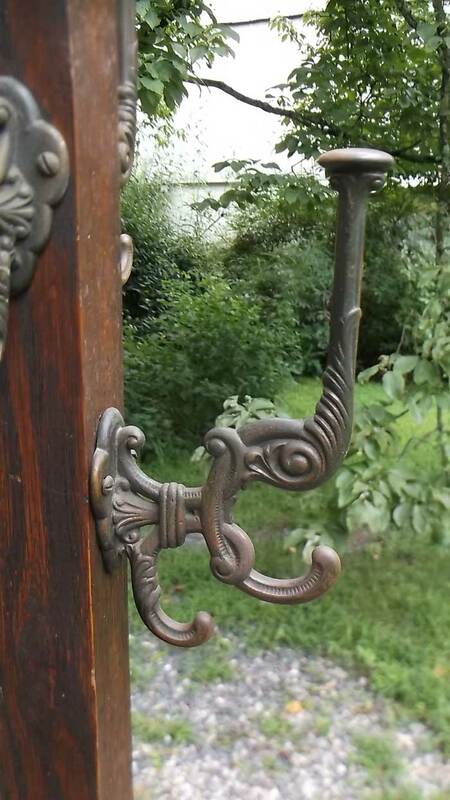 You won’t find another this nice! And now for something completely different! A solid mahogany clothes hamper! NOT METAL! 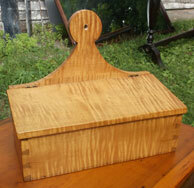 Vented top, hinged lid, LIKE NEW CONDITION! 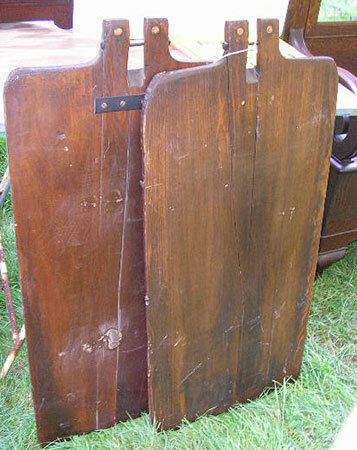 Circa 1910, solid Oak, good patina with metal brackets on legs and interesting coat hooks.